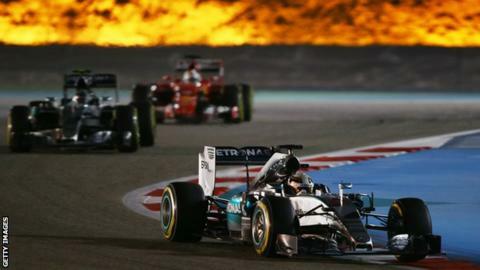 Can Lewis Hamilton win the Bahrain Grand Prix for a third year in a row, after victories in 2014 and 2015? The huge accident suffered by Fernando Alonso at the Australian Grand Prix has been used by some as an illustration of why increased cockpit head protection in Formula 1 is a bad idea. It was the exact opposite. The issue raised was the potential problems that a driver might have in getting out of an upturned car if it was fitted with a device such as the "halo" that is planned for introduction in 2017. To my mind, the accident was very strong evidence as to why it is vital for F1 to keep working on cockpit safety. First of all, it is important to say that a driver can get out of the car with the halo fitted - it has been specifically designed that way. In fact, the scariest aspect of Alonso's accident was how close the car was to the wall when it came to rest upside down - and by extension how close his head came to hitting it. So any structure that further protects the driver's head in that scenario, or any other in which an object could hit it, has got to be a good thing. This is not a dissimilar situation to the accident that killed Brazilian Marco Campos in a Formula 3000 race at Magny-Cours in 1994. His car flipped and landed upside down on the concrete wall beside the track. Even if a driver was stuck in an upturned car as a result of having extra protection, it is much better to wait and be extracted correctly by the appropriate medically trained people than to have a serious head injury. In many ways, the halo is the logical extension of all the development on head and neck safety in recent years. The Head and Neck Safety (Hans) device that protects the driver's neck from extreme movements did not make getting out of the car any easier. Nor do high cockpit sides. And yet the drivers found ways of getting out anyway in the time required by regulations. We find solutions to problems, but ultimately the focus has to be on the safety advantage over the potential negatives. At the start of the Australian Grand Prix, with Sebastian Vettel and Kimi Raikkonen running one-two after the Mercedes drivers made bad starts, it looked as if the season might start with a shock Ferrari victory. That did not happen in the end. One big reason for that was the tyre choice Ferrari made when the race was stopped to clear up the Alonso accident. That definitely played into Mercedes' hands. Having said that, the red flag did also wipe out their advantage. A clean race would have been closer. But I'm not sure Vettel had the speed to win anyway. I suspect if the race had played out, Vettel might have been passed at the second pit stops by Nico Rosberg's Mercedes, which was clearly that little bit faster. But Vettel would certainly have beaten Lewis Hamilton's Mercedes to second in that scenario. There is a long way to go, but Australia proved that Ferrari are indeed that bit closer to Mercedes this year. There was also evidence that Mercedes still had some weaknesses - the start, in particular, with both Mercedes slow off the line and beaten away by the two cars behind them. It was just like Silverstone last year, when the same thing happened with the two Williams cars. Only one race into the season is a little early to be forming any firm conclusions, but the evidence from Australia is that while Ferrari are closer this year, they are still too far away to race with Mercedes consistently. But they can certainly challenge them on occasion. There is still nothing that says the Mercedes is not the fastest car. However, the fact that teams now have three types of tyre to choose from rather than two allows more freedom, and the potential for performance deficits to be reduced. It allows teams to maybe tune their tyre allocation to what they want for their car. Some cars inherently prefer a harder tyre, some a softer one. Quite often the designers don't know why, but each car has a unique way of working with the tyre and interacting with the track. That was obvious last year, when the Ferrari worked very well on the super-soft in Singapore, extracting performance out of it that Mercedes could not. It was interesting that in the pre-season test in Barcelona, Mercedes leaned towards the soft and medium for their performance tyres, and did not even run the super-soft. In Bahrain, last year Pirelli took the soft and medium tyres, and the difference between them was up to two seconds a lap. So I'm not surprised everyone has jumped towards the super-soft this year, as it suggests that is what everyone needed. Bahrain is a track dominated by big braking down into slow corners. The average corner speed is even slower than in Melbourne, a street track. It's a night race, so the temperatures are cooler than you'd expect and it's quite easy to overtake. They have each chosen six sets of super-softs for the weekend. But Mercedes have gone for six sets of softs and only one of mediums and Ferrari four softs and three mediums. Mercedes' strategy mirrors what they did in Australia - they did not run the medium tyre at all in practice. And yet it was the one that won them the race when they fitted it to both cars to run long to the end. They had the confidence to do that because they had done so much running with it in winter testing. Ferrari's choice suggests they may be leaning towards the medium as a race tyre in Bahrain - and that they want to try it in practice beforehand to check how it works. In that decision, there will be an element of the ambient temperature - the medium has a lower-working temperature range than the soft and super-soft, so it may work better after the sun sets. Behind Mercedes and Ferrari, it is very close between Red Bull, Williams and Toro Rosso, with Force India and the new Haas team not far behind. Red Bull won that fight in Melbourne, with Daniel Ricciardo taking fourth from Felipe Massa's Williams, who were slightly worryingly off the pace on a track that should suit their car. But the fastest qualifier out of those teams was Toro Rosso, who under-performed in a messy race. It will be worth keeping an eye on the battle between the two drivers at Toro Rosso, Max Verstappen and Carlos Sainz. There is a lot at stake there, as Red Bull motorsport boss Helmut Marko has made it clear the one who loses will be out at the end of the season - as is the Red Bull way. Both are quick - as is the car, now fitted with a 2015 Ferrari engine. We heard a lot of potty-mouth on the radio from Verstappen - who I am sure paid quite some money into the swear jar after the race - about being held up behind Sainz, about the timing of pit stops and so on. It was just a bit of frustration, because he was that little bit quicker but he was not able to take advantage of it. Ultimately, there was no reason why Sainz should move aside for him - just as Verstappen refused to do for Sainz in Singapore last year. And in the end, it was Verstappen who made the misjudgement and spun. What we were seeing in that race was both drivers laying out their positions. Verstappen was trying to demonstrate that he was team leader - and he wanted the other car moved out of his way. Sainz was being steadfast and demonstrating he was not just going to roll over. I'm sure that is not the last time we will see sparks flying at Toro Rosso. The car is good enough for both to take the fight to their rivals for serious points positions, and it is a good indicator to Marko as to whether there is a natural successor to Daniel Ricciardo and Daniil Kvyat at Red Bull. The ramifications of this fight go way beyond just staying in F1. Verstappen is already hot property and both Mercedes and Ferrari have an eye on him. He has a contract with Red Bull until the end of 2017 but if he is not promoted to the senior team next year he may be looking elsewhere. At Red Bull, Ricciardo has a contract to 2018 so Kvyat is the most vulnerable. But Ricciardo is also of interest to Mercedes and Ferrari, both of whom potentially have a seat open at the end of the year. At the same time, the next Red Bull junior in line is their reserve driver Pierre Gasly, who has been fighting for victories in GP2 and is likely to be a title contender this year. So he is going to be knocking on the door of the Toro Rosso seat. All in all, there is quite a conundrum building up there at Red Bull. The decision by the Grand Prix Drivers' Association to write a public letter stating their position on the political situation in F1 is a very interesting development. The GPDA has been much more proactive since former driver Alex Wurz became its chairman last year. It conducted a fan survey last year. Wurz has made public interventions this last winter, on the drivers' behalf, on both the drivers' dissatisfaction with Pirelli tyres and on their desire to see the halo introduced in 2017. Having Wurz there means the GPDA has someone at the helm who can be a little more forthright because he is not a current driver so he can't be leaned on. His career is not in jeopardy. Grand Prix Drivers' Association (GPDA) directors Jenson Button, Sebastian Vettel and Alex Wurz wrote a letter on behalf of the drivers, to the owners and stakeholders of F1, urging them to" restructure its governance"
The letter was handled in a very sensible way. It made some very valid points and it has laid out a clear and honest position. There's nothing wrong with asking for a re-evaluation of the decision-making processes - especially given the mounting evidence that F1 has a problem on that front, most recently with the debacle over the qualifying format. Having the drivers speaking with one voice can only be good for F1. There are definitely times they should not be consulted - but equally many when their perspective is important. It's clear they have stepped forward and said they want to be invited to the party more often. They are a concerned voice about the way F1 is progressing. Right now, that makes them one of many.